Plaque disclosing tablets can help you brush better by revealing where plaque is hiding on your teeth. Just chew one cherry flavored Two-Tone Tablet after you brush your teeth. Older plaque will be temporarily stained blue, and newer plaque will temporarily be stained red. Whether you have braces or not, you can use this disclosing solution to show how much plaque is left on your teeth after you brush. Two-Tone Tablets contain a harmless blue and red dye that is attracted to the bacteria and plaque on your teeth and other surfaces in your mouth. The other photo on this page shows how plaque is stained blue and red on the teeth after using Two Tone Tablets. Two Tone Tablets are great for people with braces, or to help teach kids how to brush properly (use only with adult supervision). Don't worry, the staining is only temporary. It totally disappears after brushing and rinsing a few times. For instructions, click on the "Instructions & FAQs" tab. Use Two Tone Disclosing Tablets regularly until you find no more stained areas of dental plaque. Recheck your brushing habits with the disclosing solution again after a few weeks to ensure that you are brushing properly. Each cherry flavored tablet is individually wrapped. There are 25 tablets per package, with instructions. Note: This product can stain fabrics and some surfaces, so please be very careful when using it. Children should have adult supervision when using this product. Any stains inside your teeth, gums, or lips usually fade and disappear after you brush a few times. May stain elastic ligatures ("o-rings") on braces. If you're concerned about staining your elastic ligatures, use this product only before you have your ligatures changed by your orthodontist or dentist. It is more likely to stain clear or light colored ligatures than dark ones. First, brush and floss as you normally do. Place one tablet in your mouth, chew it, and allow it to mix with your saliva. Swish the mixture in your mouth for about 30 seconds. Run some water in your sink, then spit out the solution into the running water. (Running the water helps ensure that you don't stain your sink). Then, examine your teeth for plaque colored by the dye. Because the dye stains all bacteria, your tongue and gums also may get stained and remain stained until you brush your teeth a few times. Older plaque is stained blue, and newer plaque is stained red. Anything that is stained contains bacteria, and is considered not properly cleaned. So, the next time you brush your teeth, pay special attention to these areas. Use Two Tone Disclosing Tablets regularly until you find no more stained areas of dental plaque. Recheck your brushing habits with the disclosing solution again after a few weeks to ensure that you are brushing properly. Just how clean are your teeth after you brush? 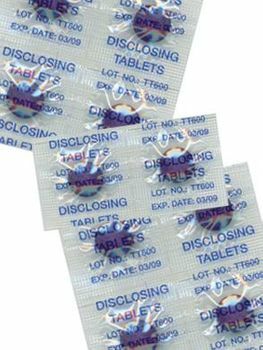 Disclosing liquid and tablets let you know for sure. It's a good way to help improve your oral hygiene, and is an especially useful tool for teaching children to brush properly. I only have one caveat about disclosing products: they may stain the elastic ligatures "o-rings" of your braces. So be careful using them and follow the instructions! Would prefer liquid to tablet, but without that option....this does exactly what it is supposed to do. Prompt shipment. Good price. Happy with transaction. Even after brushing your teeth, it's still stained. It doesn't matter how many times you brush your teeth, it still stains. Merchant Response:Yes, the product is meant to stain your teeth temporarily to show plaque. The stains usually wear off after a few brushings, within 12 to 24 hours. This is actually the first complaint we've had about this product in the many years that we have been carrying it. Most customers don't have any problems with it. Really encourages my eight year old to brush her teeth. I have been searching for these for a long time. I'm glad I was able to find them, My kids aren't but that's half the fun! My kids are getting better with bridging their teeth every day. excellent product, they work very well on adults teeth too, and they take very bad care of their teeth, im 60 and i used them too. I've been trying to teach my 6-year-old to brush more effectively, but he just wasn't understanding. His dentist gave us a few samples of some other plaque disclosing tablets, and being able to see the plaque that he'd missed certainly helped. I looked to order more and found these. These are far better. Because they dye old plaque and new plaque two different colors, we use them once or twice a week and we can see where he missed that night and where he's been missing consistently. I even use them occasionally, myself, and it's helped me zero in on spots that I apparently wasn't cleaning as well as I thought. good teaching tool for a 4yr old. These tablets are helping us teach a 4 yr old how to properly brush is own teeth. He thinks it is great and is able to brush all the purple off. We are having less frustration with teaching self-brushing. We used this product as part of a science fair experiment. It was a great help. We had speedy delivery and the product was as advertised.